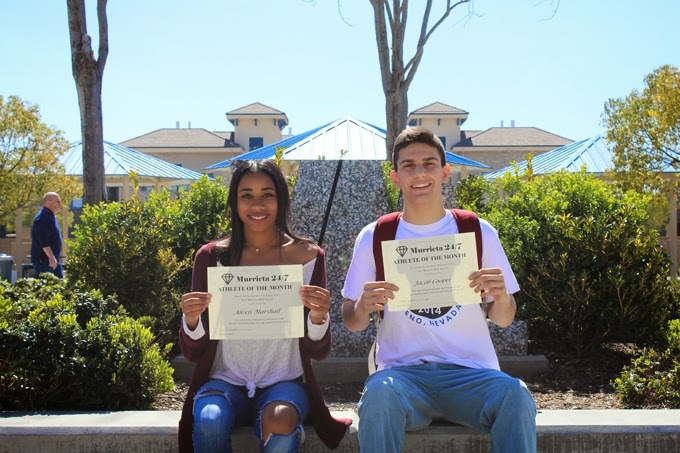 Wrestler Jacob Cooper and girls basketball player Alexis Marshall have been named the Murrieta 24/7 Athletes of the Month from Vista Murrieta High School. Cooper's season has been an example of determination. He suffered minor ligament tears in his knee in mid-January and was expected to miss two months, but he was back in two weeks. This Friday, he will be one of two juniors on the team to represent the Broncos at the state meet in Bakersfield. "I had an injury I really wasn't supposed to come back from, but through a lot of rehab, I was determined to get back on the mat," said Cooper. During his comeback, Cooper placed second in league, fourth in the CIF finals and third at the Masters meet. The 138-pounder said he draws much of the inspiration from his father. "It's been support from everyone around me, especially my dad," he said. "He's my biggest supporter. He knows when to push me, even if I'm getting tired. He knows it will all be worth it in the long run." Marshall is a shooting guard for the Broncos girls basketball team, which will play in the state tournament next week against an opponent yet to be determined. Vista won its first-round CIF Southern Section playoff game to earn a berth into the state tournament, but a loss in the second round meant the Broncos are having to wait two weeks to play their next game. "We've been practicing with the boys," Marshall said. "That's a really hard workout for us. They challenge us a lot. They're more athletic than the girls we play." Marshall plans to study biology at Cal State Monterey Bay next season. Each athlete received a certificate from Murrieta 24/7 and two tickets to Rock Fitness gym, from Sun Pro Solar, sponsor of the award.